As a precautionary measure to protect public health, the Medicines and Healthcare products Regulatory Agency (MHRA) today recalled 3 batches of Losartan tablets due to contamination with the nitrosamine N-nitroso-N-methylamino butyric acid (NMBA). The affected batches can be viewed here. Currently there is no evidence that nitrosamine impurities can cause harm and patients are being advised to continue taking their medication. Our priority as regulator is to make sure the medicines you and your family take are effective and acceptably safe. 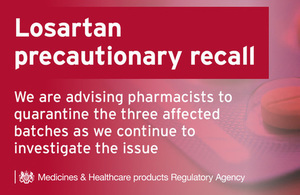 This recall shows we are continuing to investigate potential contamination of sartan containing medicines. There is no evidence at present that medicines containing NDMA, NDEA or NMBA have caused any harm to patients and this recall is a precautionary measure. Because of the risk associated with suddenly stopping high blood pressure medication, continue to take your medicines as prescribed by your doctor. Please speak to your doctor or pharmacist if you have any concerns about your medicine.